The Lighthouse Construction Industry Charity has raised concerns surrounding the statistics that two construction workers take their own life every single working day. Statistics have also revealed that stress, anxiety and depression currently accounts for a fifth of all work-related illness. 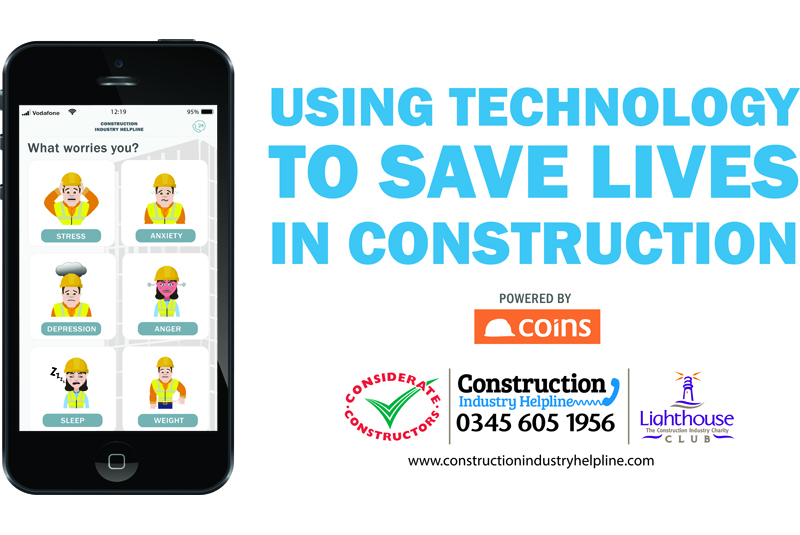 Therefore, a new collaboration between the Lighthouse Construction Industry Charity, construction software firm ‘COINS’ and ‘Building Mental Health’, is aiming to address this sensitive subject with a new ‘Construction Industry Helpline’ app. The free mental health app will provide vital information, advice and guidance on many wellbeing topics including stress, anxiety, depression, anger and suicidal thoughts. The app, which is 100% confidential, will be launched on Friday 7 December 2018 at the Charity’s annual Christmas Lunch, held at the Westminster Park Plaza Hotel in London. Although the construction industry is rising to the challenge of creating a healthier workplace, finding the right support is reportedly not always easy. The Lighthouse Club are already helping to drive significant change through a variety of mental health and wellbeing support programmes – but have said that there is still a long way to go, before the culture in construction removes the stigma from talking about mental health and wellbeing. By providing a free app, which can be downloaded by anyone in the industry, they hope to combat this. The ‘Construction Industry Helpline’ app will provide information, advice and guidance about how people can relieve the long term effects of stress, anxiety or depression as well as providing access to other areas of support such as anger management, drug and alcohol dependency, debt management, legal advice, and emergency financial aid. COINS, who have over 35 years’ experience developing software solutions for construction companies, are also said to be passionate about giving something back to the industry. The Construction Industry Helpline app can be downloaded on Google Play or the App Store.